Background: India faces an acute shortage of health personnel. Together with inequalities in distribution of health workers, this shortfall impedes progress towards achievement of the Millennium Development Goals. The aim of this study was to assess health-workforce distribution, identify inequalities in health-worker provision and estimate the impact of this maldistribution on key health outcomes in India. Materials and Methods: Health-workforce availability and production were assessed by use of year-end data for 2009 obtained from the Indian Ministry of Statistics and Programme Implementation. Inequalities in the distribution of doctors, dentists, nurses and midwives were estimated by use of the Gini coefficient and the relation between health-worker density and selected health outcomes was assessed by linear regression. Results: Inequalities in the availability of health workers exist in India. Certain states are experiencing an acute shortage of health personnel. Inequalities in the distribution of health workers are highest for doctors and dentists and have a significant effect on health outcomes. Conclusion: Although the production of health workers has expanded greatly in recent years, the problems of imbalances in their distribution persist. As India seeks to achieve universal health coverage by 2020, the realization of this goal remains challenged by the current lack of availability and inequitable distribution of appropriately trained, motivated and supported health workers. In addition to the known shortage of health workers, there is a common perception that large in-country inequalities exist in their distribution. To date, the evidence to support this proposition has been limited, owing to a lack of reliable disaggregated data at the country level. This study therefore used the most up-to-date data available to assess the production, employment and distributional patterns of health workers in India. Inequalities in health-worker distribution at the state level and the impact of this maldistribution on key health outcomes were also assessed. Although WHO defines health workers  as "all people engaged in actions whose primary intent is to enhance health", the term "health worker" in this study was restricted to three categories: Doctors, dentists and nurses/midwives. Year-end data for 2009 on these health workers at the state level were obtained from the Indian Ministry of Statistics and Programme Implementation's 2011 Report on Health and Family Welfare. In this report, estimates on health-worker stock were derived from three databases: (i) allopathic medical practitioners registered with state medical councils; (ii) dental surgeons registered with the central/state dental councils; and (iii) information on registered nurses and midwives available to the Indian Nursing Council and Central Bureau of Health Information, Directorate General of Health Services, Government of India. In addition, national and state data on the number of educational institutions in medicine, dentistry and nursing/midwifery, as well as the number of admitted students, were extracted from the Medical Council of India (MCI), Dental Council of India (DCI) and Indian Nursing Council (INC) databases. ,, Ministry of Health and Family Welfare documents were used to assess the employment of health personnel and number of vacant health-worker posts. This latter analysis was limited to the public sector, since data on private-sector employment were not available. For state-wise analysis, population projections published by the Registrar General of India  were adjusted for differences in the projected and estimated populations from the 2011 census. Densities of health workers were calculated from the workforce data described above and census data on populations. National time trends for health-worker densities were calculated for 2000-2009. Where subnational data were available, Lorenz curves and Gini indices were calculated to assess geographical inequalities in doctor, dentist and nurse/midwife densities. The Gini coefficient and Lorenz curve are measures of inequality and have been used in previous studies of health workforce inequality. , This inequality analysis was based on the density at the first administrative division below national level, which is equivalent to the state level in India. Spearmans's rank correlation coefficient was calculated to assess the relation between health-worker density and gross domestic product (GDP) at the state level. GDP data were derived from Reserve Bank of India Handbook of Statistics on Indian Economy. The relation between health-worker density and selected health outcomes was assessed by linear regression of data on infant mortality, maternal mortality, mortality in children younger than 5 years and measles immunization coverage from the 2010 Government of India Annual Report to the People on Health  against the density of health professionals. All variables were transformed into natural logarithms. Data analyses were done with STATA version 10.0. [Table 1] shows the absolute numbers and category-wise density (per 1000 population) of doctors, dentists and nurses including midwives at the national and state levels. In 2009, India had 761 806 doctors, 104 603 dentists and 1 650 180 nurses and midwives. At the national level, the aggregate density of doctors, nurses and midwives was 2.08 per 1000 population, which was lower than WHO's critical shortage threshold of 2.28. There were gross inequalities in the availability of these health workers at the subnational level. 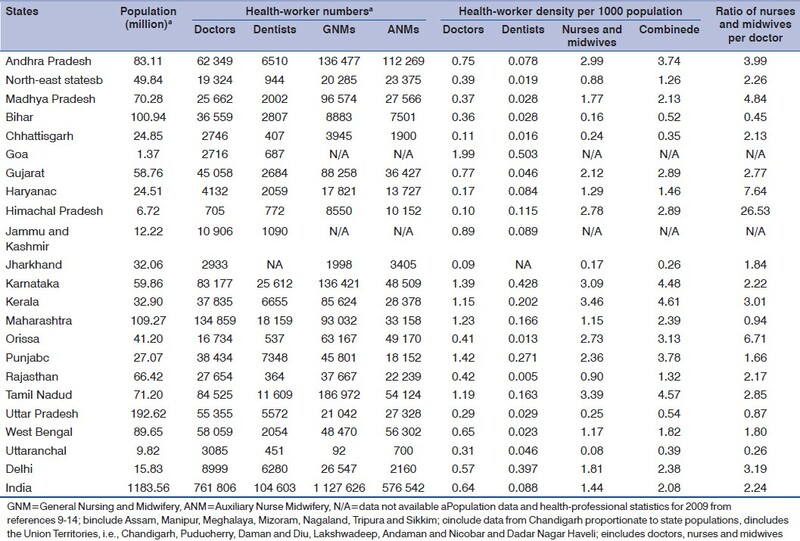 For example, states such as Bihar, Uttar Pradesh, Uttarakhand, Jharkhand and Chhattisgarh had especially severe shortages of health workers [[less than 1 per 1000 population; [Table 1]. The 1993 World Development Report  recommended that the ratio of nurses to doctors should exceed 2:1 as a minimum, with 4:1 or higher considered best for cost-effective quality care. In 2009 the ratio of nurses to doctors in India was 1.5:1, while the ratio of nurses/midwives to doctors was 2.2:1. There was substantial variation at the state level, the ratio being lower than the national average in six out of the eight Empowered Action Group states1 [Table 1]. 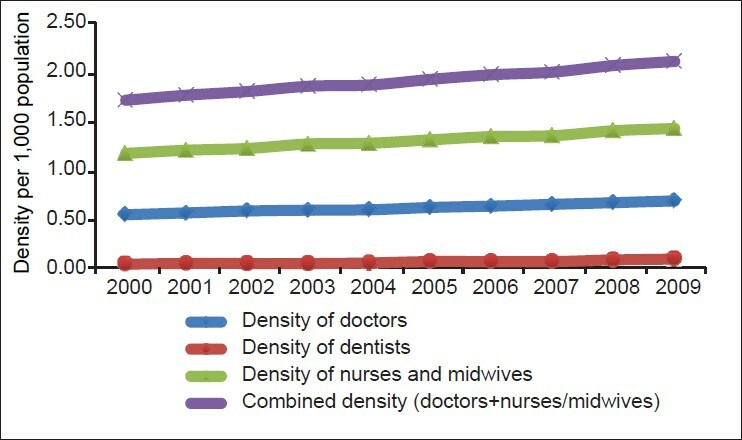 In the decade between 2000 and 2009, both the absolute numbers and the densities of doctors, dentists and nurses/including midwives have steadily increased. [Figure 1] illustrates the trend in densities. Review of the available data on training of health workers highlights three important developments. First is the recent rapid expansion in the training capacity of health workers. Between 1991 and 2013, the number of admissions to medical colleges increased from 22 438 to 49 508, i.e. by 121%, while within the same period admissions to dental institutions expanded from 3100 to 23 800, i.e. by 668%. , Similar increases occurred in nursing. In 1997, there were 659 General Nursing and Midwifery and 485 Auxiliary Nurse Midwifery institutes, which increased more than threefold to 2487 and 1307 institutes, respectively, in 2012. Likewise, the number of recognized nursing institutes offering the Bachelor of Science in Nursing (BSc) degree has increased from 165 in 2004  to 1507 in 2012 [Table 2]. There were clear inequalities in the distribution of these training institutions among states. Although the Empowered Action Group states account for almost half of the country's population, they house only approximately one-fifth of the medical colleges and a quarter of the dental and nursing institutes. Second, there has been a notable increase in the private sector's involvement in medical education. Prior to 1991, there were 144 medical colleges in India, 101 (70%) of which were public colleges. By 2013, the number of institutions recognized or approved by the MCI had increased to 371. There has been a disproportionate increase in the number of nongovernment colleges; 152 (67%) of the 227 new institutions are private. Similarly, before 1991, there were 49 dental colleges, of which 23 (47%) were government owned. 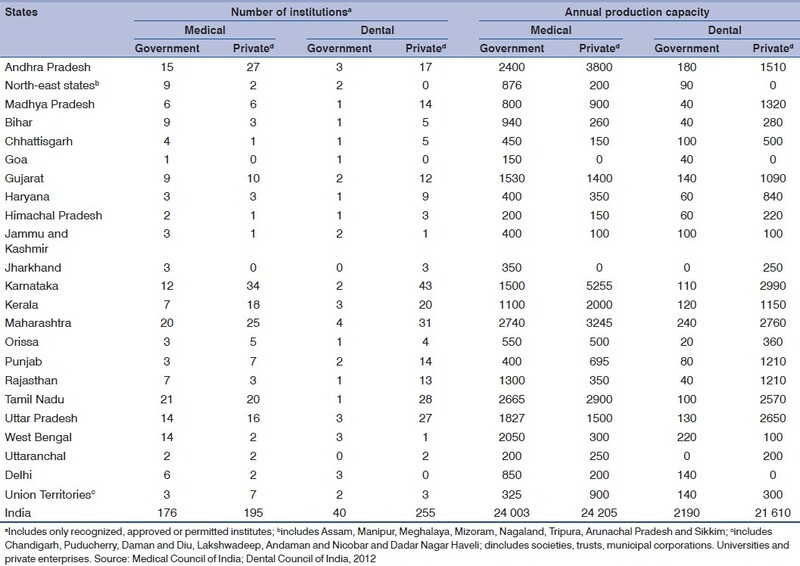 As of 2013, 246 new dental institutions recognized or approved by the DCI have been added to the existing list, of which almost all (229) are in the private sector [[author's calculation based on data from reference 10; [Table 3]. Third, despite the consistent increase in health-worker production, posts in public-health facilities remain unfilled. Between 2007  and 2009,  the stock of health workers, i.e. doctors, dentists, nurses and midwives increased by 264 225. Over the same period, however, the total number of vacant posts in government health staff positions improved little or increased. For instance, vacant posts for medical officers at primary health centres and specialists at community health centres, increased by 43.6% and 17.5%, respectively, during 2005-2010, with Empowered Action Group states contributing to two-fifths of these vacancies. , Even when allowance for staff attrition and creation of new posts is made, the trends in vacancies do not match production patterns. Intra-state differences in health-worker availability, which may be associated with the urban-rural divide and corresponding economic disparities, could not be assessed owing to lack of access to district-level data. The analysis was therefore limited to inter-state inequalities in availability of doctors, dentists, nurses and midwives in 2009. Overall inter-state inequalities were very high, with Gini coefficients of 0.424 for doctors, 0.569 for dentists and 0.412 for nurses (note that these Gini coefficients are calculated across population groups - states with an average population of 33 815 979 individuals - rather than across individuals themselves). There was a positive correlation between state GDP and density of doctors, dentists, nurses and midwives (Spearman's rho = 0.353; P = 0.116), implying that low-income states are disadvantaged in terms of concentration of health workers. [Table 4] presents the regression results of selected national health outcomes and worker density. The results indicate that the density of doctors, nurses and midwives is associated with the variation in rates of maternal mortality, infant mortality, under-5 mortality and measles immunization. The effect of increased density was greater in reducing maternal than in reducing child mortality. The primary data used in these analyses are the numbers of health personnel registered with the respective professional councils and therefore have several limitations. These councils do not maintain live registers, except for doctors in Delhi. The information they provide may be inaccurate owing to nonadjustment for deaths, migrations and retirements, or double counting of workers registered in more than one state. Furthermore, not all state councils follow the same procedure for registration, which may compromise direct comparisons. Data for health workers in some states (e.g. north-east India) are not available because there are no state-specific professional councils. In addition, the analyses were limited to the supply or availability of health workers and do not examine the factors such as the quality or adequacy of services provided. Nevertheless, the data used provide the most up-to-date information on India's health workforce, are maintained by the WHO Global Atlas More Details  and have been used extensively for both intra-country and cross-country comparisons. Notwithstanding these limitations, this analysis has highlighted some key issues that the Government of India and development partners should consider when addressing the health human resource crisis. There is gross inadequacy of the current stock of health workers available and significant inequalities in their distribution between the different states. Poorly performing states, in terms of health outcomes, have a greater shortfall in the number of health workers. These shortages highlight the need to develop and implement high quality, evidence-based, costed workforce plans, especially in the poorest and most fragile states. In the past two decades, there has been tremendous progress in increasing the training capacity. This analysis suggests three key findings regarding workforce production. First, the increase in training capacity has been largely because of the growth in private-sector involvement in medical education. This trend seems likely to increase, since incentives and regulation relaxations have been introduced to encourage private investment in medical education. While privatization of medical education has helped to overcome the shortcomings resulting from inadequate expansion of the training capacity in the public sector, it has also raised questions on the quality of medical training. An example of an initiative to standardize the quality of medical education is the MCI's decision to introduce a single National Eligibility and Entrance Test for undergraduate admissions at all government and private medical colleges. This test has not yet been implemented and there is scepticism as to how it might be transparently and fairly applied to the 800 000 students who would take the test each year. Second is the gross inequality in the distribution of the training institutes among the different states. These institutes are primarily clustered in states with high GDPs, where the issues related to shortages of health workers are relatively less acute. Third is the increased mismatch between health-worker production and vacant staff posts in the public-health systems. This finding suggests that increases in the production and overall supply of medical graduates will not necessarily address the public sector shortages. Other strategies will need to be introduced to encourage health workers to serve in the public sector. These findings highlight major inequalities in the distribution of health workers between the states. The imbalances in the distributions of doctors and dentists were found to be higher than those for nurses. Our estimates of the inter-state inequality in the health-worker distributions were similar to previously reported estimates. The Gini index for doctors was 0.424 and for nurses and midwives was 0.412, while in a previous report  it was estimated to be 0.4365 and 0.5271, respectively. These findings suggest that over a period of almost a decade there has been minimal improvement in the distribution pattern of doctors, despite rapid increases in production. The current estimates do however suggest an improvement in the distribution of nurses and midwives. Economically disadvantaged states had both lower densities of workers and less-educated workforces. These inequalities in the availability of health workers possibly explain the inequities in health outcomes across the states, as demonstrated in the regression results. Since less-developed states are likely to have lower levels of investments in health and health systems, training, recruitment and retention of skilled health workers will remain a persistent challenge. In conclusion, while production of health workers has greatly expanded in recent years, this has been at the cost of increased privatization of medical education in India. The rapid growth in the production of health workers such as doctors, dentists, nurses and midwives has not helped fill vacant positions in the public-health system. Further, the problems of imbalances in the distribution of these health personnel persist, with certain states remaining at a disadvantage. These findings suggest that mere increase in production capacity is unlikely to resolve the issues related to health-worker availability or distribution. There is an urgent need to adopt sustained and innovative actions to address India's current health-workforce crisis. 1. States with poor health outcomes identified on a priority basis by the National Rural Health Mission in India: Bihar, Chhattisgarh, Uttar Pradesh, Madhya Pradesh, Orissa, Jharkhand, Uttarakhand and Rajasthan. 1. Sheikh M. Health workers and the MDGs: Inextricably linked. Commonwealth Ministers Reference Book. London: Commonwealth Secretariat; 2012. p. 231-4. 2. World Health Organization and Global Health Workforce Alliance Scaling Up, Saving Lives Task Force for Scaling Up Education and Training for Health Workers. 2008. 3. Anand S, Bärnighausen T. Health workers at the core of the health system: Framework and research issues. Health Policy. 2011. 4. Sheikh M. Trained Health Workers: A Key to the MDGs. Available from: http://www.mdg-review.org/index.php/Sections/39-healthcare/57-trained-health-workers-a-key-to-the-mdgs [Last accessed date 2013 May 2]. 5. Joint Learning Initiative: Human Resources for Health: Overcoming the Crisis. Cambridge: Harvard University Press; 2004. 6. Rao M, Rao KD, Shiva Kumar AK, Chatterjee M, Sundararaman T. Human resources for health in India. Lancet 2011;377:587-98. 7. World Health Organization. The world health report 2006 - Working together for health. Geneva, World Health Organization. 2006. 8. Ministry of Statistics and Programme Implementation. India Statistics. Available from: http://mospi.nic.in/Mospi_New/site/India_Statistics.aspx?status=1 and menu_id=14 [Last accessed on 2013 May 9]. 9. Medical Council of India. Available from: http://www.mciindia.org/InformationDesk/MedicalCollegeHospitals/ListofCollegesTeachingMBBS.aspx [Last accessed on 2013 Sept 10]. 10. Dental Council of India. Available from: http://www.dciindia.org/[Last accessed on 2013 Sept 10]. 12. Ministry of Health and Family Welfare, Government of India (2010). Rural Health Statistics in India. Available from: http://mohfw.nic.in/BULLETIN%20ON.htm [Last accessed on 2013 May 15]. 13. Office of the Registrar General and Census Commissioner (2006). Population Projections for India and States 2001-2026: Report of the technical group on population projections constituted by the National Commission on Population. 14. Census 2011. Office of the Registrar General and Census Commissioner, Ministry of Home Affairs, Government of India. 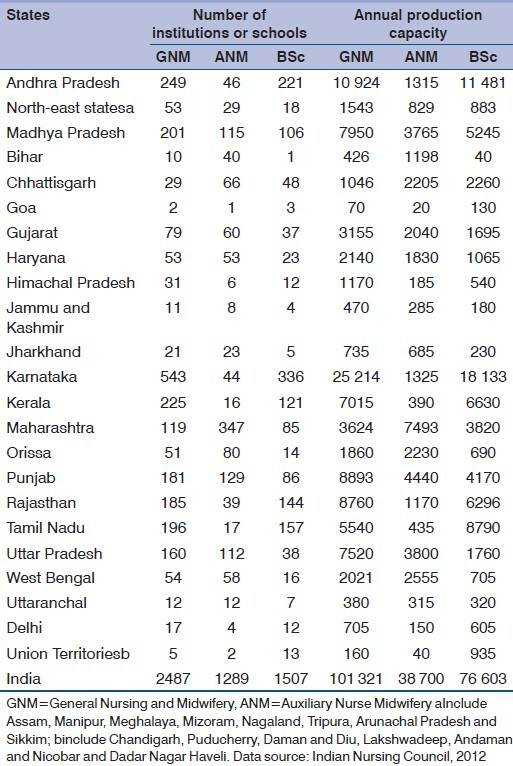 Available from: http://www.censusindia.gov.in/2011-prov-results/prov_results_paper1_india.html [Last accessed on 2013 Jan 3]. 15. Anand S, Fan VY, Zhang J, Zhang L, Ke Y, Dong Z, et al. China′s human resources for health: Quantity, quality, and distribution. Lancet 2008;372:1774-81. 16. Anand S. Measuring health workforce inequalities: methods and application to China and India. World Health Organization, 2010. 17. Reserve Bank of India. Handbook of Statistics on Indian Economy. Available from: http://www.rbi.org.in/scripts/AnnualPublications.aspx?head=Handbook%20of%20Statistics%20on%20Indian%20Economy [Last accessed on 2013 July 7]. 18. Ministry of Health and Family Welfare, Government of India (2010). Annual Report to the People on Health. Available from: http://mohfw.nic.in/inde×1.php?lang=1 and level=0 and linkid=35 and lid=29 [Last accessed on 2013 May 5]. 19. World Bank (1993). World Development Report 1993: Investing in Health. Available from: http://go.worldbank.org/6R5DC7G090 [Last accessed on 2013 May 10]. 20. Khadria B. International nurse recruitment in India. Health Serv Res 2007;42:1429-36. 21. Central Bureau of Health Intelligence. National Health Profile 2008 - Human Resources in Health Sector. Available from: http://cbhidghs.nic.in/inde×2.asp?slid=1000 and sublinkid=706 [Last accessed on 2013 May 2]. 22. Central Bureau of Health Intelligence. National Health Profile 2010 - Human Resources in Health Sector. Available from: http://cbhidghs.nic.in/inde×2.asp?slid=1125 and sublinkid=929 [Last accessed on 2013 May 4]. 23. Ministry of Health and Family Welfare, Government of India (2006). Rural Health Statistics in India. 24. Anand S, Bärnighausen T. Human resources and health outcomes: cross-country econometric study. Lancet 2004;364:1603-9. 25. WHO Global Atlas of the Health Workforce. Available from: http://apps.who.int/globalatlas/default.asp. [Last accessed on 2013 Jan 20]. 26. Common medical test postponed to 2013-14. The Hindu. Available from: http://www.thehindu.com/education/issues/article2710175.ece [Last accessed on 2013 May 17]. 27. Doctors for the villages. The Hindu. Available from: http://www.thehindu.com/opinion/editorial/article99452.ece [Last accessed on 2013 May 16]. 28. Evaluation Study of National Rural Health Mission (NRHM) In 7 States. Programme Evaluation Organisation, Planning Commission, Government of India. New Delhi, February 2011.